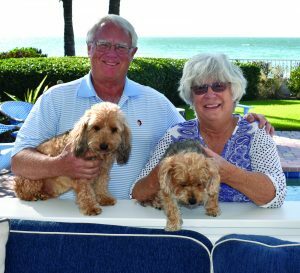 BY SUE ERWIN – When Boca Grande residents Peter and Elsa Soderberg learned that Suncoast Humane Society needed a catalyst to help kick-start the campaign for a new campus, they took action. The Soderbergs scheduled a meeting with Executive Director Phil Snyder and offered a $1 million gift to get the project going. The organization needs $9 million to build the new facility. “We hope this will help bring forward everyone’s passion to help give these wonderful animals a new home,” Peter said. 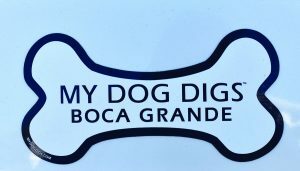 Elsa and Peter have lived in Boca Grande since 2010, and they have a great love for animals – especially dogs, since Peter is allergic to cats. They were drawn to the island in part because it is so well known for residents with beloved canine companions. They currently have two rescued dogs: Benny and Bea. Benny is an 11-year-old longhair Bichon Frise, and Bea is a Yorkie. Elsa is from upstate New York and has been coming to Boca Grande ever since she was a young girl. She has been the co-chair of Boca Bargains for seven years. “The money raised helps with local scholarships and nonprofits in the area,” she said. Elsa takes extra time each season to sort through the donated items and take leftover goods like gently used towels and blankets to the Humane Society in Englewood. “They are always in need of items that help comfort the dogs in the kennels and for cleaning,” she said. The Boca Grande Woman’s Club holds a dog show fundraiser every two years, with proceeds going to the shelter. Peter said the Suncoast Humane Society is rated four out of four stars by Charity Navigator, the nation’s largest and most utilized evaluator of nonprofit organizations. Suncoast Humane Society opened its doors in 1971. A 2012 assessment of the facility by architects and engineers determined that the structure, HVAC and plumbing were inadequate to properly care for the animals entrusted to the shelter. Often, staff offices are used as temporary space for incoming animals as they are processed into the system. In 2015, the Board of Trustees authorized the purchase of 11.5 acres for a new facility and grounds just down the street from the current building. This location would allow more space to fulfill the organization’s mission to improve the quality of life for the animals. “We learned of a bank foreclosure and purchased the land for $327,000. The same property had been purchased in 2006 for $2.5 million,” Snyder said in a previous interview. The Suncoast Humane Society is holding a “Petwalk” from 9 a.m. to 1 p.m. on Saturday, Dec. 9 to benefit homeless animals. Participants are asked to meet at Centennial Park in Venice. Pets are welcome. The Boca Grande Club will be hosting the 10th annual Tennis Ball to benefit SHS on Wednesday, January 24, 2018. Tickets are $125. Proceeds from the annual event will go toward the fundraising campaign. A cocktail party fundraiser is being planned on the island soon. Elsa plans to help organize and volunteer at the event. For more information on the fundraising campaign, visit humane.org.